With the high temperatures and the blue/green algae problem, September was not a very good month for us on Lake Texoma. As we moved into October the fishing really picked up. We started the first Saturday in October with our yearly Great White Hunt Trip. 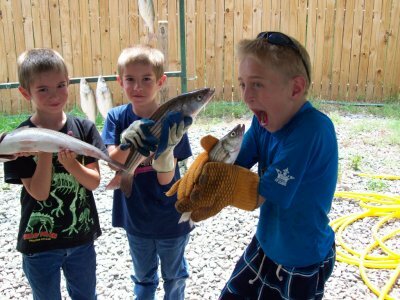 We had 160 anglers,3 6 guides, a catering service for the fish fry and alot of great help. Thanks to everyone who participated, it was a huge success. Our Lake Texoma water temperature is 67 degrees lake elevation is 609.85 (7.33 low). Lake Texoma elevation is 613.84 and the water temperature is 86 degrees. 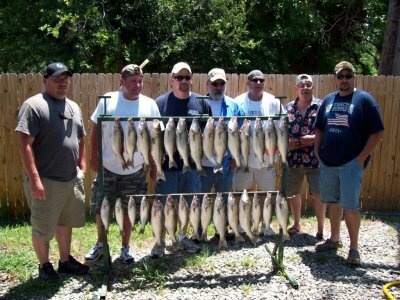 Over this past week we've seen alot more Lake Texoma stripers feeding on the surface. 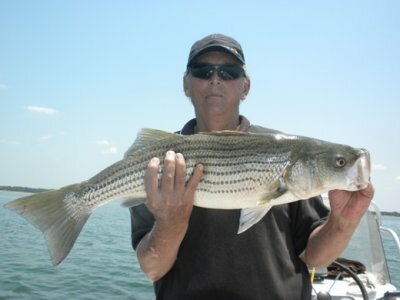 Most days the top water action is short lived and then the striper schools move and may pop up further down the lake. We have had a couple days that the stripers stayed on the surface feeding for a good 20 minutes or so and that was with at least 60 or so boats pushing them hard. As of last week I have taken the bait tank out of my boat and am now fishing exclusively topwater and slabs. My topwater choice at this time is actually a swim bait (cojo minnow) and my choice of slab is a 1 1/2 or 2 oz chartreuse and white TNT 180. We received an inquiry on the status of the top water action on Lake Texoma. 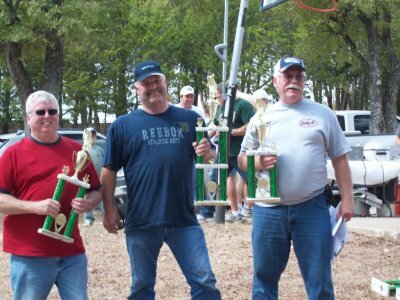 Usually July heralds some fantastic top water fishing on Lake Texoma. Last year was an exception with the bait fish die off, but this year is beginning to look promising. 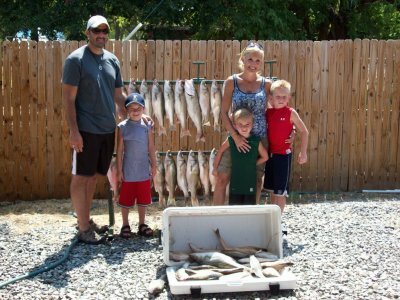 As of now, we hear that there is still plenty of bait fish and the stripers are still deep enough that the top water action is sporadic at best. We have heard stories of schools hitting top, but the action doesn't last long at all. With the water temp rising the oxygen levels in the lake should force the bait fish up which the stripers will follow and the top water action will be on. Stay tuned. Lake Texoma elevation is 614.64 and our water temperature is 81 degrees. We are starting to see more larger stripers this past two weeks as they start to make their deep water runs on the south end of the lake. The stripers are still in the 65-75 foot water and moving fast but we have seen fish in the 11-18 lb range occasionally with alot of 2-4 lb fish. Limits of these good stripers is still hit and miss and it has been an early bite. 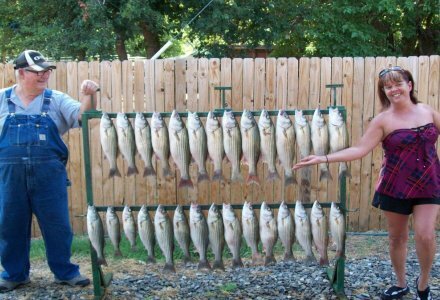 Lake Texoma elevation is 615.98 and water temp is 74 degrees.This past week our striper fishing has improved considerably. 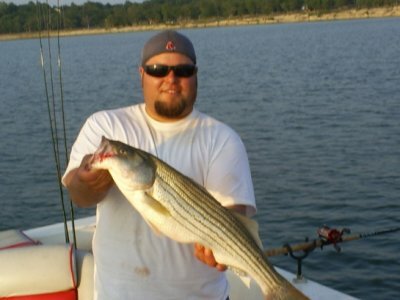 The stripers on Lake Texoma are stacked in the deep water( 65-75ft). Live bait has been lethal. Up until this past week limits of good stripers have been hard to come by daily. This past few days fast limits and really nice stripers in the 17-24" range are plentiful.Were still catching allot of male fish with a few females mixed in and they are still on the spawn.A couple more weeks and the spawn should be completely finished and the striper fishing will only continue to get hotter.So if you've waited to book you Lake Texoma striper trip now is definitely the time to start making plans to come out and striper fish beautiful Lake Texoma.